The Romanian Easter is an Orthodox holiday – 86.8 percent of Romanians are Orthodox. So it is very likely all the Easter traditions you will see are Orthodox ones. Easter (or the Resurrection) celebrates Jesus' ascension to Heaven. This is always a Sunday holiday and the Monday after is usually a free day. The word for Easter in Romania is Paste, with its other form Pasti. The most commonly known and widespread Easter tradition in Romania is painting eggs – you will find this wherever in Romania you choose to spend Easter. How the eggs are painted will vary from one region to the other – red is the common denominator and the traditional color (it symbolizes Jesus' blood), but in modern days Easter eggs go in many other colors. Basically, you would boil the eggs and then place them in special egg paint that you can buy in most supermarkets and hypermarket. 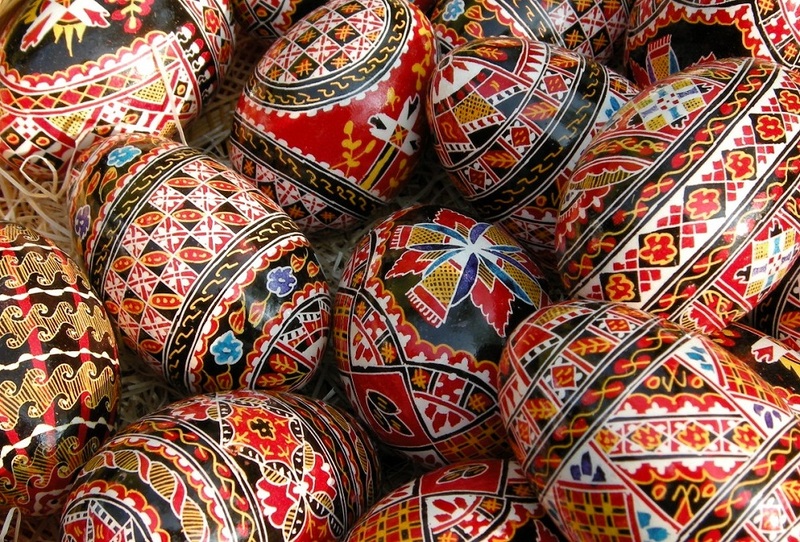 But what's specific to Romania is the tradition of painting the multi-colored eggs, with complicated motifs which vary from region to region. They are usually sold in traditional fairs and some can come up pretty expensive. These are empty egg shells which are each painted manually – it's a lot of work and not everybody can do this. 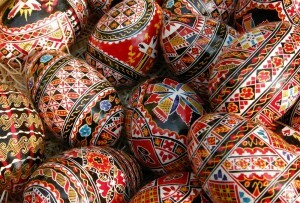 You can find these painted eggs at the monasteries in Northern Romania, in Moldova, for example. The traditional food for Easter is anything based on lamb meat. Romanians also bake a cake with cheese, called "Pasca". The Romanian cake called “cozonac” is also baked for this holiday (and for other holidays as well). A loaf of cozonac and a few red eggs are usually the alms gift, a traditional give away which is believed to feed the souls of those who have died. The Resurrection itself is celebrated on the nigh before the Easter Day – this year the Orthodox Easter is on April 4. The nigh before that people go to church to light the candle and bring the resurrection light into their homes. On their way back to their homes, people would share the holy candle fire with others. The belief is that each church gets light from God, with the main source being the holy fire in Jerusalem. This is a miracle which happens each year on resurrection – in the tomb where Jesus was buried, a flame bursts out of nowhere, after a priest says certain prayers. The holy fire is then spread throughout the world. The Romanian Orthodox Church has been bringing the holy fire to Romania too in the last couple of years.